(L-R) Judelyn Perfecio, James Lacang, Andrew Abanto, and Elmer Cuyaco were allegedly caught selling shabu while riding a car in Barangay Poblacion, Panglao on Friday. A woman, a seaman and two other men were arrested after they were allegedly caught selling illegal drugs while on board a sedan in Panglao on Friday. 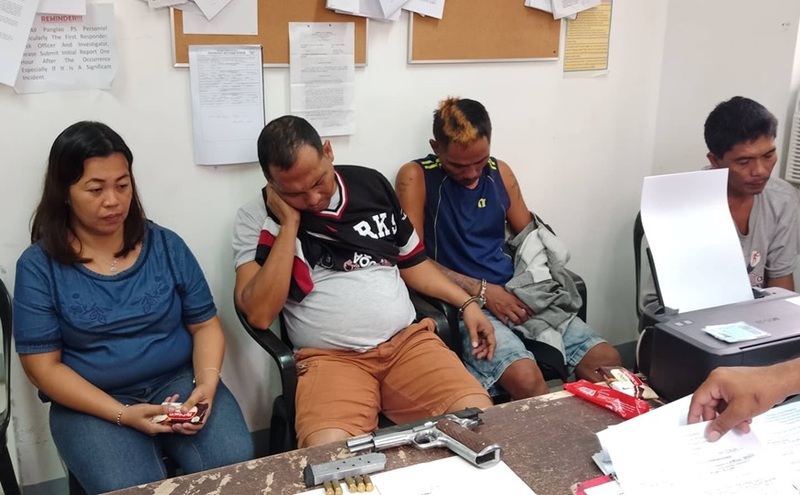 The suspected drug dealers were allegedly in possession of shabu with an estimated street value of P20,400 while one of them, James Lacang, a seaman and the operation’s target, was caught with a loaded .45 caliber pistol. Police identified the other suspects as Judelyn Perfecio, 39; Andrew Abanto, 35; and Elmer Cuyacot, 39; all residents of Dauis. According to police, the suspects were spotted selling shabu on board a Toyota Vios prompting officers to set up a buy-bust operation. An undercover officer then transacted with Lacang and his group leading to their immediate arrest.